In theory, translating Halfbrick's popular fruit-slicing mobile title to Kinect is a remarkable idea. It's hard not to buy into the idea of one-to-one karate chopping of juicy produce in your living room. Fortunately, in practice, Fruit Ninja Kinect works and plays just as well as you'd hope. The concept is simple: from off-screen, fruits are tossed into your field of view and it's your job to cut them down for points. 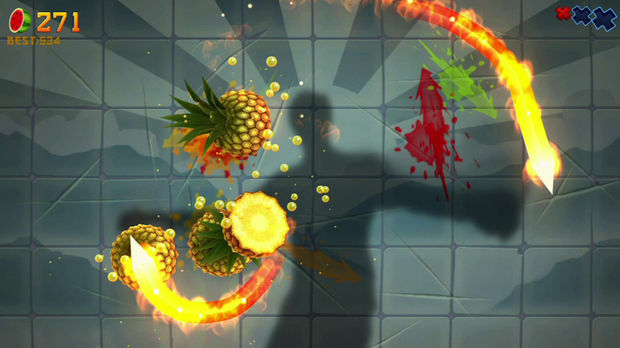 In the case of Fruit Ninja Kinect, this is done by simply swiping or chopping with your hands. If you've any concerns about the accuracy of Microsoft's Kinect and potential irritations, squash them right now. Whatever magic Halfbrick has harnessed needs to be shared with other developers; Fruit Ninja Kinect's feeling of one-to-one accuracy is a triumph. Rarely did I find myself frustrated when attempting to demolish a pear or a watermelon. While there's that first moment or two where you'll have to orient yourself in the game space, once you find your positioning, swiping at the fruit you see on any part of the screen is never an issue. This is made even easier by an on-screen background shadow which mimics your own movements, and helps you simply and quickly establish your location. Splattering fruits with total body movement is certainly more visceral than the passive finger swipes of the mobile iterations, as well, and it's utterly empowering and endlessly satisfying. Fruit Ninja Kinect also tracks your slices based on your speed, meaning that it generally will only respond to swift movements. This is particularly useful in game modes that require you to show restraint and not hit certain objects, like bombs. While the game is generally rather intelligent in knowing your slicing intentions, sometimes there's a hiccup. On more than a few occasions I accidentally swiped at a bomb when just trying to scratch my nose. That's more my fault than the game's; I should be able to control myself for the few minutes that each round lasts. Still, it's worth mentioning, as that's obviously not an issue with touchscreen versions of the game. 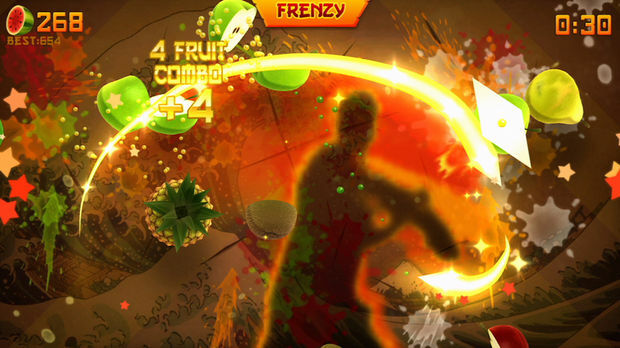 The single player game modes Halfbrick has included with Fruit Ninja Kinect are identical to its mobile companions. The game's "Classic" mode tasks you with hitting all fruit thrown up on a screen, with the game ending when you miss three or hit a single bomb. The game's timed "Arcade" mode gives you one minute to destroy as much fruit as possible, with bonus power up fruits thrown into the mix. Then there's the game's "Zen" mode, which does away with all of the bombs and power ups, a minute and a half of mostly stress-free fruit carving. Given that there are only three modes, not one of which offers more than a few minutes of gameplay, the question of the game's value rears its head. (The game is priced at 800 MS Points, or $10.) 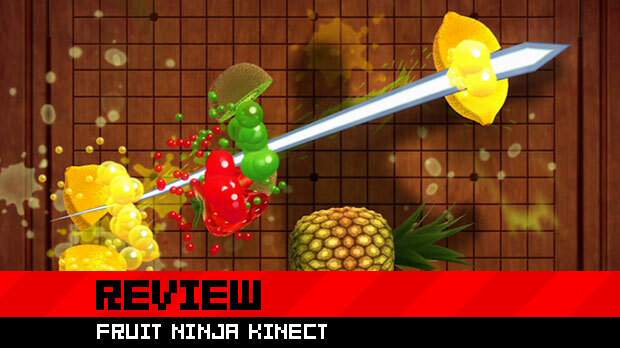 Fruit Ninja Kinect is more than the sum of its parts, though. While the gameplay itself is best suited to short sessions (this is a physical game, so prepare to sweat), its replayability hinges on the game's leaderboards. Without any campaign-style progression, most of my play time was spent trying to out-slice my friends. It's certainly a strong incentive to continue playing, and Halfbrick knows that's the game's meat and potatoes. The developer has designed the leaderboards so they're consistently shown to players, and its main menu displays a randomized game "challenge" that often tasks you with one-upping a friend's score. Halfbrick did build some rather fun multiplayer modes into Fruit Ninja Kinect, which could extend the game's life in "party" scenarios. One mode has two players scoring cooperatively, sharing bonuses and power-ups. But it's the competitive mode that will likely get the most play. In this mode, each player has to swipe at their own fruits, while avoiding that of their opponents. Bonus point "free for all" fruits fly across both sides of the screen, and points are lost for squashing your adversary's produce. Things can get hectic as rounds come to a close, and it's tempting to enter your competitors game space to physically nudge them aside for an advantage. 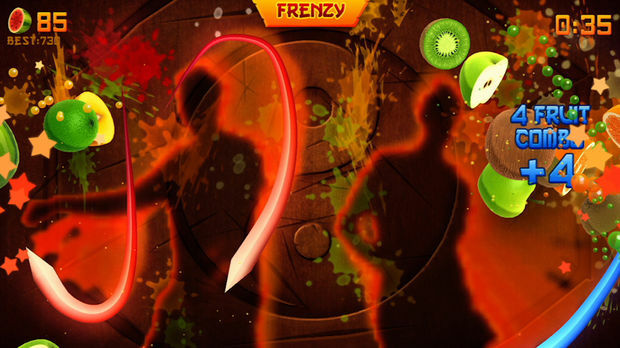 If you've played Fruit Ninja on a mobile device, you should know what you're getting into with this Kinect iteration. The core gameplay is identical, and it's arguably even more fun using your full body versus lazily swiping a finger across a touchscreen. But it's also a game that's 99 cents for iOS, and currently free (though ad-supported) for Android devices. With all of that said, its $10 price point may be the only thing that would keep someone from picking up Fruit Ninja Kinect. Even still, it's unquestionably enjoyable, and easily the best version of Halfbrick's popular title. If you're motivated by outscoring your friends or see a rowdy fruit slicing party with friends in the future, you won't regret a Fruit Ninja Kinect purchase.